The Anguis fragilis, or slow worm, is a limbless lizard native to Eurasia. It is sometimes called a blindworm. Its German name, "Blindschleiche," is derived from the Old High German plintslîcho meaning "blinding creeper", perhaps because of its lustrous scales. Slow worms are semifossorial (burrowing) lizards, spending much of the time hiding underneath objects. The skin of slow worms is smooth with scales that do not overlap one another. Like many other lizards, slow worms autotomize, meaning that they have the ability to shed their tails to escape predators. While the tail regrows, it does not reach its original length. They are common in gardens and can be encouraged to enter and help remove pest insects by placing black plastic or a piece of tin on the ground. On warm days, one or more slow worms will often be found underneath these heat collectors. One of the biggest causes of mortality in slow worms in suburban areas is the domestic cat, against which it has no defense. Close-up of the head of a slow worm. These reptiles are mostly active during the twilight and occasionally bask in the sun, but are more often found hiding beneath rocks and logs. They are carnivorous and, because they feed on slugs and worms, they can often be found in long grass and other damp environments. The females give birth to live young (ovoviviparous birth). In the days leading up to birth, the female can often be seen basking in the sun on a warm road. Although these lizards are often mistaken for snakes, a number of features differentiate them. The most important one is that they have small eyes with eyelids that, like other lizards, blink. Unlike snakes, they may also have visible ears. They shed their skin in patches, whereas most snakes shed their whole skin. 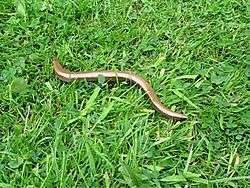 Slow worms may also shed their tails (autotomy) as a defence mechanism, by breaking one of their tail vertebrae in half. Also, the pattern of their ventral scales is totally different from that of snakes. Adult slow worms grow to be about 50 cm long, and are known for their exceptionally long lives; the slow worm may be the longest-living lizard, living about 30 years in the wild and up to 54 years in captivity (this record is held by a male slow worm that lived at the Copenhagen Zoo from 1962 to 2009). The female often has a stripe along the spine and dark sides, while the male may have blue spots dorsally. Juveniles of both sexes are gold with dark brown bellies and sides with a dark stripe along the spine. In the United Kingdom, the slow worm has been granted protected status, alongside all other native British reptile species. The slow worm has been decreasing in numbers, and under the Wildlife and Countryside Act 1981, it is illegal to intentionally kill, injure, sell or advertise to sell them. 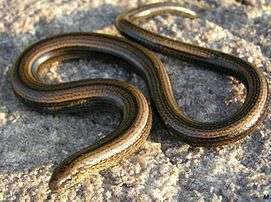 The slow worm is not native to Ireland, but is believed to have been illegally introduced in the 1970s. It has been sighted only in parts of County Clare, mainly in the Burren region. The subspecies A. f. fragilis is found all over Europe, while A. f. colchicus is found in southeastern Europe, the Caucasus, and Iran. Wikimedia Commons has media related to Anguis fragilis. ↑ "Feeding state and selected body temperatures in the slowworm" (pdf). Herpetological Journal. 18: 59–62. 2008. Archived (PDF) from the original on 17 June 2009. Retrieved 2009-06-03. ↑ "BBC - Science & Nature - Wildfacts - Slow worm". BBC. Archived from the original on 4 May 2007. Retrieved 2007-05-16. ↑ "Wildlife and Countryside Act 1981". Legislation.gov.uk. Retrieved 20 September 2015. ↑ "Archived copy" (PDF). Archived from the original (PDF) on 2014-02-03. Retrieved 2014-01-25.